Combat Unit comes packed with explosive and dynamic characters. The unit includes 3 male and 3 female military figures. The characters come in all the standard StoryBoard Artist positions including close-ups and action shots. Add some unique artwork to your project by grabbing some graphics from our Add-On Libraries. 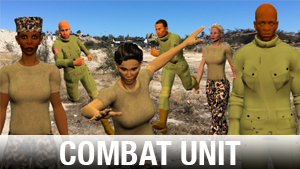 Modeled after our current military, the Combat Unit is packed with a diverse selection of characters. Get the Combat Characters Today! SGT Lynn: She knows her job and she brings an unparalleled level of sophistication and expertise. SSG Cavazos: He is highly skilled in his occupation and sets the example for military discipline and professionalism. SGT Ramirez: She has a spunky, yet mature attitude; a natural leader with a touch of sweetness. SGT Nguyen: He is known for his adherence to the army values of loyalty, duty, respect, and honor. SGT Jackson: As a member of the enlisted service, her college degree makes her an important asset to the military. SSG Adams: With 10+ years of experience, he has the skills to play dangerous roles and extreme missions.